Richard Grayson's son John, who had been turned into the Ultra-Humanite's Humanite Firepattern, hesitates to accomplish his mission to take the Pandora Vessel when seeing his father. He escapes Fury, with the Huntress following him secretly. Batman had placed a tracer on John. However, the Ultra-Humanite is not pleased with Firepattern's disobedience. Some mental command from the villain causes the youth to fall in mid-flight. More on John Grayson and the Huntress' search for him will be revealed in Earth 2: Society Annual #1, on sale August 31, 2016. 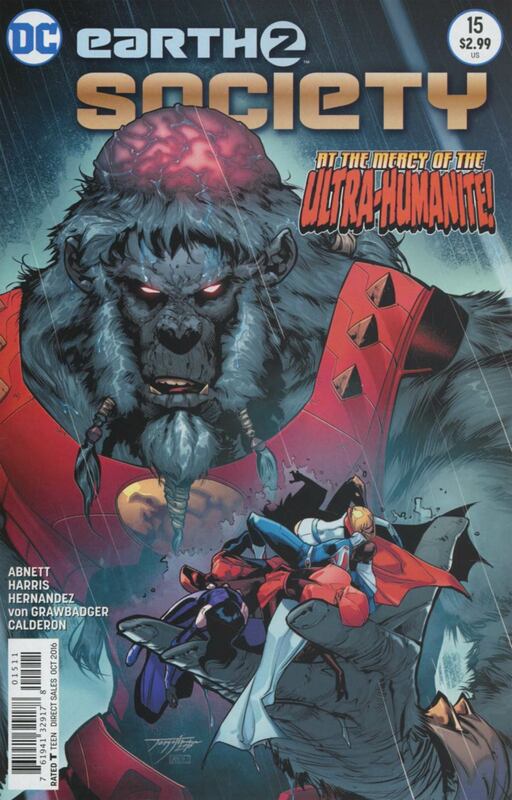 Story - 5: I wish Abnett had given us a little more background on how the Ultra-Humanite got a hold of Batman's son. (If that's covered in previous Earth 2 books, I apologize as I haven't had time to sit down and read them all.) Maybe that will be covered in the upcoming Annual. If so, I'll cut Abnett some slack as he's saving this title with entertaining stories that could give the rest of the DC books a run for their money. This one was a pleasure to read. Art - 4: The first eight pages stick out like a sore thumb. Had Tony Harris or Angel Hernandez drawn the entire issue, the artistic changes wouldn't be so hard on the eyes. These visuals bog down what is truly an excellent book otherwise. Cover Art - 4: It feels like DC wants this cover to make buyers believe that a lot more happens in this issue than what's printed. In spite of this, the image is well drawn.